MMS OCTOBER 2018 76 mmsonline.com DATA-DRIVEN MANUFACTURING is international. The vehicle of this expansion will be blockchain, the record-keeping tech- nology underlying cryptocurrencies like Bitcoin. 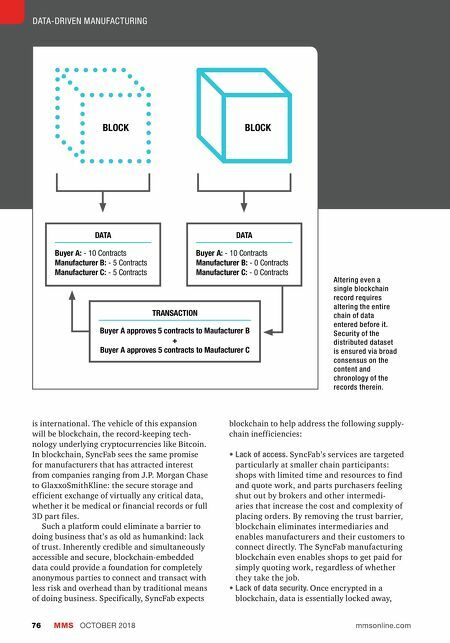 In blockchain, SyncFab sees the same promise for manufacturers that has attracted interest from companies ranging from J.P. Morgan Chase to GlaxxoSmithKline: the secure storage and efficient exchange of virtually any critical data, whether it be medical or financial records or full 3D part files. Such a platform could eliminate a barrier to doing business that's as old as humankind: lack of trust. Inherently credible and simultaneously accessible and secure, blockchain-embedded data could provide a foundation for completely anonymous parties to connect and transact with less risk and overhead than by traditional means of doing business. Specifically, SyncFab expects blockchain to help address the following supply- chain inefficiencies: • Lack of access. SyncFab's ser vices are targeted particularly at smaller chain participants: shops with limited time and resources to find and quote work, and parts purchasers feeling shut out by brokers and other intermedi- aries that increase the cost and complexity of placing orders. By removing the trust barrier, blockchain eliminates intermediaries and enables manufacturers and their customers to connect directly. The SyncFab manufacturing blockchain even enables shops to get paid for simply quoting work, regardless of whether they take the job. • Lack of data security. Once encrypted in a blockchain, data is essentially locked away, DATA Buyer A: - 10 Contracts Manufacturer B: - 5 Contracts Manufacturer C: - 5 Contracts DATA Buyer A: - 10 Contracts Manufacturer B: - 0 Contracts Manufacturer C: - 0 Contracts TRANSACTION Buyer A approves 5 contracts to Maufacturer B + Buyer A approves 5 contracts to Maufacturer C BLOCK BLOCK Altering even a single blockchain record requires altering the entire chain of data entered before it. Security of the distributed dataset is ensured via broad consensus on the content and chronology of the records therein.